It's week three of our Aurifil Ornament hop...have you been stitchin? Today is the day to hop on over to see Pam Kitty Morning, Victoria and the Lizzie B Cre8tive girls. They have super cute patterns ready for you to download. Next week we have three more ornaments for you so be sure to come back! Don't forget to leave comments on the featured blogs to be entered to win some super prizes and if you forgot to comment on the past blogs...no problem, you can comment up to the end of the hop to be entered to win. And who wouldn't want some wonderful Aurifil thread! Fall flew by and the Holidays are right around the corner. So to help you get ready, the 2012 Aurifil Designers have each created an ornament just for you! For the next 4 weeks we will be posting free ornament patterns on three of our blogs for a total of 12 free ornaments. And if you leave a comment on each of the featured blogs for that week, you will be entered to win some wonderful prizes from Aurifil. Download Click here to download your copy of my flaky little ornament. Now hop on over to Gail Pan and then on to Amy's Creative Side to pick up their patterns so you can then get stitching. Be sure to leave me a comment so you will entered for the prizes and please ask your friends to join us too! Yes, I know it's June but I wanted to share with you a new book that I have. It's called "Simply Christmas" and it's all about Christmas and stitching. The whole book is designed for all you embroidery lovers out there. It's a fun collection of projects.....8 projects in all! "Trim the Towel for Christmas".......perfect for teacher or co-worker gifts! "Tag that Gift".......reuseable every year! And last but not least, "Cup of Cheer"! I love little projects that I can get done in a night or two. Nothing better than working on quick and easy Christmas gifts a few months ahead of time so that when the holidays arrive you will be ready to wrap, not stressing over unfinished gifts! I will be giving away two copies of "Simply Christmas" and all you have to do is leave me a comment to be entered! The lucky winners will be drawn on Monday, June 25th. It's March! Which means it's time to meet Victoria Findlay Wolfe. She is the March designer for Aurifil's 2012 Designer of the Month program. She has designed a super cute pattern called "Spring if We're Lucky". Hop on over to the Aurifil blog to read all about her! Have you been stitching with us each month? If you are, and we sure hope you are, be sure to post your finished pictures on the Flickr page so that you will be entered to win some of the wonderful prizes that Aurifil has in store for you. If you are looking for the thread used each month contact Rosebud's Cottage. She is carrying the thread collections....just give her a call and she will pop them in the mail to you. Hope you are enjoying a wonderful Valentines Day! It's a finishing pattern to the "Snow Much Love" pattern that was on the Aurifil blog a week or so ago. If you need the pattern for the embroidery, hop on over to the Aurifil blog and download your copy and get stitching. Then you can save your embroidery for the wall hanging pattern that will be published sometime in the spring. (I will let you know when it's published.) Or you can download my pattern and finish your project off today! It's a cute little wallhanging that goes on one of the frames from Ackfeld. I was going to take the picture of it on the frame so you can see how it hangs but then I realized that all my frames are at my my mom's quilt shop on display with some of my other patterns like these. Sorry about that......but I really didn't want to wait another day to post this. I will grab one of the frames the next time I am in town and post a picture for you. Happy Valetines day to you! I am off to finish up the Boston Cream Pie I am making my family. Click here to download blog Mystery # 3 part 6. Have you checked out the Aurifil Designer of the Month Blog Hop yet? So if you are looking for some stitching to do, hop on over to the Aurifil blog and you can download your own copy of the pattern. Enjoy! 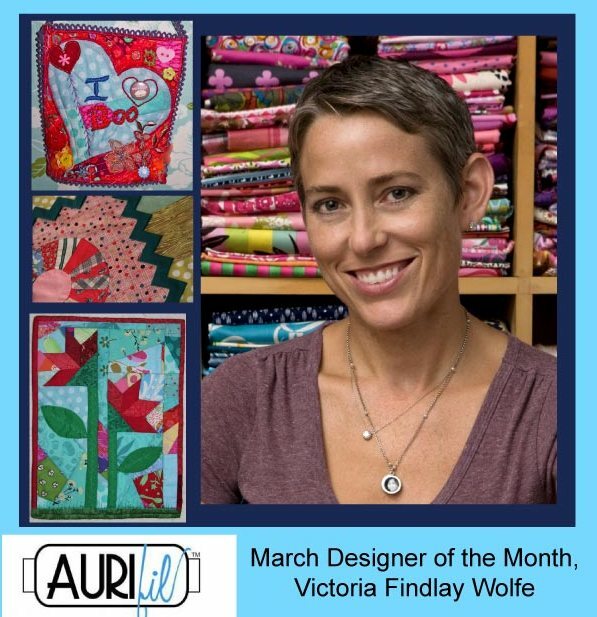 Aurifil's 2012 Designer of the Month......It's February! I hope you have already been over to the Aurifil blog and checked out the year long blog hop that includes 12 wonderful embroidery designers. We started off in January with a super cute Snow Bird design from Roseann Kermes. She is one talented lady and I hope you will check out her blog. It's February now and that means it's my turn to share an embroidery pattern with you! Since February is the month for "love" and it's winter here in Minnesota, I have designed a snowman couple sharing a little "LOVE". You can download the "Snow Much Love" pattern here on the Aurifil blog. I must confess that one of the biggest reasons I designed the snowmen is because we just haven't had enough snow this year. I know alot of people right now are saying "your crazy to want snow!" But I think there is nothing better than a fire in the fireplace, a pot of chili on the stove, some fun embroidery to work on while sitting in a comfy chair and the snow if flying outside. (With all my and your family home safe of course!) It really is a bit of heaven to watch the snow fly....yes, I know I'm kinda crazy but I really do enjoy the snow. These are the three stitches I used in my design...Feel free to use what you like and make it your own. If you are looking for a great stitch guide that you can print off and keep with your stitching projects, a great place to find it is here. I also love the Pocket Embroidery Guide. It can be found at your local quilt shops. It's the perfect sides to slip in any project bag for on-the-go stitching. I hope you will join us all as we stitch up the year. There is a quilt pattern that has been design for you to stitch all your monthly embroidery together in to a wall hanging. The pattern will be posted sometime in the spring/summer...so be sure to watch for that! I am almost done with my little extra pattern for you to use with my embroidery design. I will have that posted by the weekend. Be sure to watch for that. Also, I would like to invite you to join me on Monday's for my Mystery Monday's project. Each monday I post a bit of the mystery to be sewn up that week. The projects are small and the sewing is easy to get done within a weeks time. It's a nice way to have a little time for yourself each week. We just started Mystery #3 a few weeks ago and you can join anytime! Don't forget to circle the first thursday of each month on your calender for the next Aurifil Designer post. March will be Victoria Findlay Wolfe. Of course a blog hop has to have prizes! So when your done with your stitching, load your finished stitchery each month into the Aurifil Flickr folder. Aurifil will pick a random project once a month to win a thread gift! Aurifil's 2012 Designer Kick Off Day! A few months ago I got am email from Pat Sloan, yes THE Pat Sloan! She asked me to join her in the Aurfil 2012 Designer Blog Hop. Of course I said yes! So here is the deal.....each month a different designer will have their embroidery pattern posted on the Aurifil Blog for you to download. There is also a finishing pattern that will be posted (I think sometime this summer) that you can use to sash and finish your blocks into a super cute wall hanging. We are doing embroidery patterns this year using the wonderful 12 wt thread that Aurifil offers. Wait until you try it...you will love it! So are you excited and ready to get stitchin? Hop on over to Aurfil's blog to get started and be sure to check out Roseann's blog today too. She will be posting some stitching tips I know you won't want to miss. And yes, there will be prizes too! When you finish your monthly stitching, load it up on the Aurifil Flickr page ... some lucky winners will get some awesome thread!! I hope you will join me and the 11 other designers for a fun filled year of stitching!